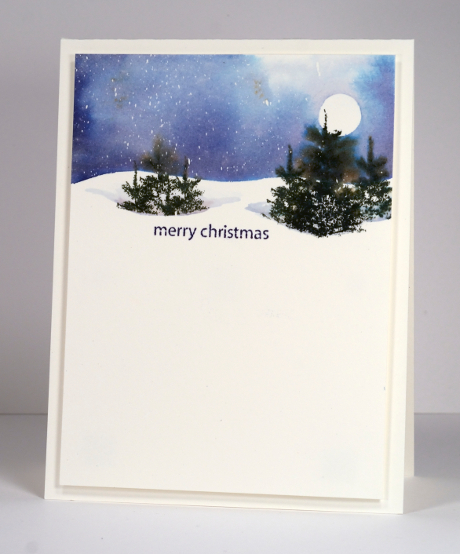 I have been creating snowy scenes with dye inks on a large watercolour block this week. When I saw sketch#95 at CAS(E) this sketch and still had a corner left on the block already flecked with masking fluid I thought I could put the two together. Sometimes when I look at a sketch I can’t see past the shapes and images in the sketch, arrows for instance in the current sketch. With this sketch I was able to see past the arrows and visualize a snowscape with a stand of trees on the right hand side. I did deviate from the sketch and add a few more trees on the left. Whether I play along or not I am always impressed by the imagination and creativity of the design team members in their interpretations of each week’s sketch. To create the scene I punched a little circle mask for the moon and painted the sky in two blue distress stains. I added two dips with the same stains then stamped trees in memento ink. When all was dry I rubbed off the masking fluid. I hope you are not getting sick of these trees from the Prancers set, ‘cos I just can’t leave them alone! You can use the trees every day for a year and I would not tire of them or your wonderful creativity. Love, love, love your snowy scenes. Thank you for sharing! Wow! Such a beautiful take on the sketch! Love your wintery scene! Heather, You could use those trees every day. I Like Lercy love your winter snowy scenes so very much. Please continue to them for us. Your talent is simply out of this world. Thanks for sharing with us. Once again… I have no words to tell you how I love what you create! You are my inspiration and be sure, I always say to my friends..”it is Heather Telford who inspire me”… Je dis toujours à mes amies qui aiment mes cartes que je suis inspirée par les créations d’Heather Telford. Voilà! A BIG thanks! I would never be tired of your cards with those trees, you could make a million!! 🙂 Congrats on the tweet from Penny Black. Happy WCMD! So pretty! This looks great with the scene and sentiment clustered together in the top third. Just so you know…only 1 word…AWESOME! Just stunning Heather! Love the way you create your snow scenes. All your scenes look different in some way, keeps me coming back for more. Gorgeous! Love your masking and sponging – such a beautiful night sky. Thank you for playing along with CTS this week! This looks amazing! Wow! Fabulous take on the sketch! Really pretty. thanks for sharing.